For other uses, see Motif (disambiguation). 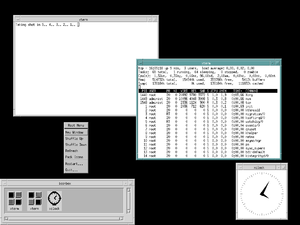 Motif is the toolkit for the Common Desktop Environment and IRIX Interactive Desktop, thus it was the standard widget toolkit for Unix. Closely related to Motif is the Motif Window Manager (MWM). After many years as proprietary software, Motif was released in 2012, as free software under the GNU Lesser General Public License (LGPL). Motif emerged in the late 1980s, as Unix workstations were on the rise, as a collaboration between Digital Equipment Corporation, Hewlett-Packard, and other companies to provide a common interface toolkit for the X Window System, to compete with the OPEN LOOK GUI. It was originally developed by the Open Software Foundation and initially released in July 1989. Motif is the basic building block of the Common Desktop Environment, which was the standard desktop for commercial Unix. The IEEE 1295 standard (now withdrawn) defines the "Motif API". As of version 2.1, Motif supports Unicode, which made it widely used in several multilingual environments. The Motif look and feel is distinguished by its use of square, chiseled, three-dimensional effects for its various user interface elements – menus, buttons, sliders, text boxes, and the like. Motif's operation was designed to correspond closely with the then-familiar Microsoft Windows and OS/2's Presentation Manager interfaces, and Microsoft played a key role in designing the original style guide. X Window System graphics stack: Motif is a library with graphical control elements. Motif was originally made available under a license requiring royalty payments. A version called Open Motif (substantially the same codebase under a different license) was released on May 15, 2000, under a license which allowed royalty-free distribution of Open Motif if the platform upon which it is used was open source – but was not an open source license itself. The name was criticized by Richard Stallman of the Free Software Foundation for likelihood to mislead people into thinking it was proper open source or free software, particularly for the Open Group's statement that they had "released the source code of Motif to the Open Source community". The initial release of Open Motif was version 2.1.30 in May 2000; Open Motif 2.3 was released in June 2007, followed by a 2.3.1 bug fix release in September 2008 and a 2.3.2 bug fix release in March 2009. During the time when Motif was closed source software, the LessTif project was created with the aim of creating a free software implementation, under the LGPL. In October 2012, Motif was released as a source code distribution under the GNU LGPL v2.1. Motif's source code is available on SourceForge. ^ "News". motif.ics.com. MotifZone. Retrieved June 13, 2013. ^ "User Interface Hybrids - Integrating User Environments with Motif". The Open Group. ^ "1295-1993 - IEEE Standard for Information Technology--X Window System--Modular Toolkit Environment (MTE)". IEEE Computer Society. Retrieved January 23, 2012. ^ "Open Group Desktop Technologies -- Motif". The Open Group. ^ Open Motif Frequently Asked Questions "For the current stable 2.1.30 release, aside from some different copyright and license statements, both Motif and Open Motif share the same functionality and source code. The primary difference between Open Motif and the commercial product is the software license". ^ "THE OPEN GROUP PUBLIC LICENSE: MOTIF GRAPHICAL USER INTERFACE SOFTWARE". The Open Group. ^ Mark Hatch (May 15, 2000). "Announce: Motif release to Open Source Community leads to Open Motif Everywhere". Newsgroup: comp.windows.x.announce. Usenet: xannounce145@ics.com. Retrieved November 29, 2013. ^ "ICS MotifZone". October 2012. Retrieved November 4, 2016. This page was last edited on 24 December 2018, at 10:57 (UTC).